My latest release, SECRET BABY, SECOND CHANCE, is a romantic suspense story set in the small town of Stillwater, Wyoming. It’s the third book in the Sons of Stillwater series (although it can be read as a standalone), and I love sitting at my laptop every day and disappearing into this new world. But what is it that gives small towns their enduring appeal, and how easy, or difficult, is it to set a series of thrillers in a place where most people know each other well? Firstly, small towns have their own personality. The people have big hearts and tons of character and, unlike in a big city, they aren’t hidden away in a crowd. Everything is on show and that makes quirks and habits stand out. The people are what brings the small town to life, whether it’s the busybody who spreads the local gossip, or the restaurant owner who remembers everyone’s favorite order. Everyone knows everyone else. A little too well at times. They have long memories and they hold grudges. It’s no good trying to pull off an act in a small town. Fake engagement? Marriage of convenience? Pretending to be someone you’re not to get that dream job? Forget it. Then there’s the history and the legends. Local ghosts, villains and horror stories…the whole town knows them word for word. They can help or hinder the characters when it comes to finding romance. Isolation, weather, quirky landscape features, local businesses and people…they all add color and depth to the story. Small town doesn’t mean dull town. And with so many interesting personalities, the opportunities to build a series and give the secondary characters a chance to shine just keep growing. The fisrt three books in the Sons of Stillwater series tell the stories of the three Delaney brothers. In the first book (Cameron’s story), Covert Kisses, the town is rocked by a serial killer. In book two, The Soldier’s Seduction, the residents are still reeling from the aftershocks of the murders when a mysterious woman appears in town and needs the help of Bryce Delaney. At the start of SECRET BABY, SECOND CHANCE, Vincente Delaney believes that his girlfriend, Beth Wade, was one of the serial killer’s victims. He finds out that, not only is she alive, she has been concealing their daughter from him. I’ve always thought that the secret baby theme in a romance story is one of the hardest to write well. It’s kind of a big deal, after all. Keeping something that huge from your partner? Is there really a way to mend the trust in a relationship after that? But Beth really had no choice. Forced to flee her home because of threats to her life and her loved ones, she also has to leave Vincente, the man with whom she shared a unique and intense relationship. It’s only after she’d gone that she realized she was pregnant. Vincente has spent months agonized by her loss, only to find that Beth has been alive all along and that he has a child he never knew existed. Getting to know his daughter and finding the person who is threatening Beth are his new priorities. Keeping them both safe from a hidden killer becomes fraught with difficulty in his hometown. It should be easy because he knows everyone, but that’s part of the problem. Staying one step ahead of danger is hard in a place that doesn’t feel dangerous. Vincente has to look on everyone with suspicion, even the people he has known all his life. I love writing small town romantic suspense…torturing my characters until the final page both emotionally and by throwing them into dangerous situations! 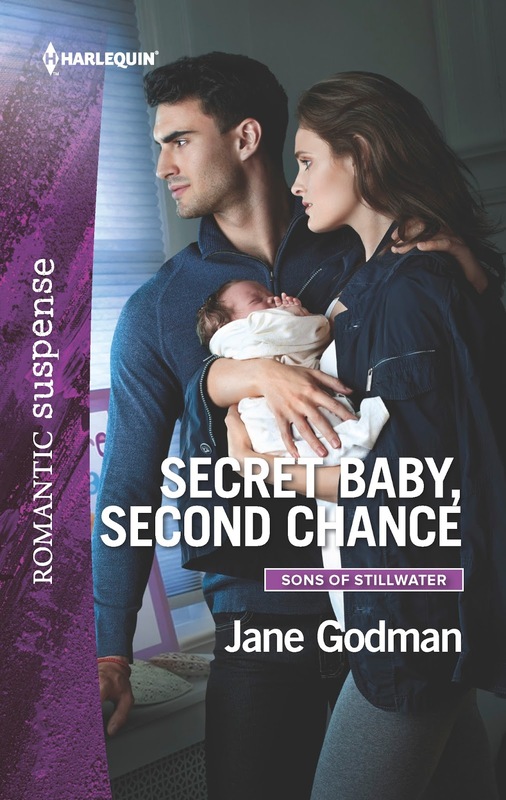 I hope you enjoy the twists and turns of both the mystery and the love story of SECRET BABY, SECOND CHANCE and the other stories that are coming soon in the Sons of Stillwater series. She hadn’t known that Lia had already been growing inside her, hadn’t noticed the missed periods and the changes in her body. Her whole focus had been on the nagging worry at the back of her mind. The worry that had ratcheted up to a whole new level a month later with the arrival of the letter and the first photograph. By the time the next one turned up in her mailbox a week before she left Stillwater, she had been half- crazy with worry. Any physical symptoms her body had been displaying had come second to the turmoil of her emotions. Receiving anonymous threats had been bad enough. When those warnings were also directed at anyone close to her, she had panicked. Because there was only one person close to her. Whether he liked it or not, Vincente had been the person who meant the most to her. Even though it had broken her heart to leave, even though missing him had been a constant ache ever since, it had seemed like the only way she could protect him. Now he was here, and she couldn't tell him the truth. I’ll come after the ones you love... The thought of those words made her shiver. Vincente frowned. Clearly, he wasn’t buying her explanation. Beth didn’t blame him. She wouldn’t herself if she was the one listening to it. A lot on my mind. It was a classic fobbing- off phrase. His lips parted in preparation to ask more just as a cry from the baby monitor, for the second time that day, provided an interruption. This cry was different. This wasn’t one of Lia’s usual noises. It was a high-pitched scream that brought Beth straight to her feet and had her running for the door. At the same time, out in the yard, Melon went into a frenzy of barking. “What is it? What’s wrong?” Picking up on her panic, Vincente was right behind her as she dashed up the stairs. SECRET BABY, SECOND CHANCE is published on January 1st 2018 and is available now to pre-order. Harlequin Intrigue and Romantic Suspense are two of my favorite lines. Small western town are perfect settings. Yes everyone knows your business, but many also have secrets. This sounds like a good one. A child in danger always adds an extra layer of suspense.